I purchased two eight-count packs of cinnamon rolls on sale at a supermarket bakery last week. They looked so good in the package, but were a little on the dry side. I immediately had the idea to turn them into some type of breakfast-y casserole or bake. What I came up with is essentially a bread pudding, but this is a little less custard-y than traditional bread puddings. 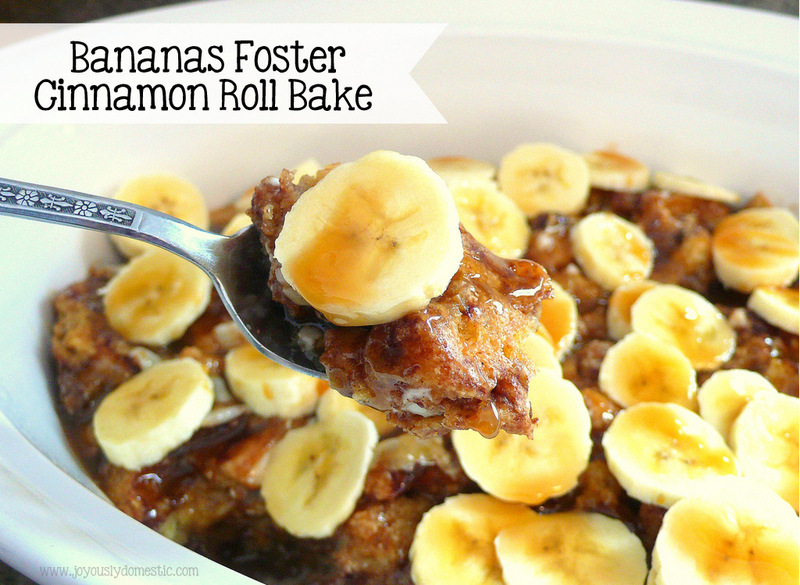 One of our family's favorite desserts is bananas foster and after recently being given a bottle of rum extract, I knew I wanted to utilize it to take this recipe over the top. I'm positive, however, that you could use a good quality vanilla extract or even some booze (wohoo!) in place of the rum extract ... and this would still be just as heavenly. I've seen cinnamon roll bread pudding made using many types of cinnamon rolls, so I'm sure the kind from the tube in the refrigerated section at the store (or even the frozen kind) that you bake at home would work great, too, in this recipe if you didn't want to purchase already-baked ones as I did. This was a huge hit at Sunday's family brunch at my mother's house. It feeds a good-size crowd and was the perfect sweet treat to go along with our savory breakfast dishes. Place the cubed rolls into a large mixing bowl. Set aside. In a medium mixing bowl, whisk together the eggs, milk, rum extract, 1/2 cup of caramel sauce, salt, cinnamon and nutmeg until well-combined. Pour custard over the cubed rolls. Stir to completely coat rolls with custard. Pour into a greased 9x 13 or similar baking dish. Allow to sit for about thirty minutes for rolls to absorb custard. Bake covered with lid or tightly covered with foil for thirty minutes. Remove lid/foil, rotate baking dish and continue baking for an additional 15 - 25 minutes or until everything appears "set." Immediately drizzle on 1/4 cup of caramel sauce. 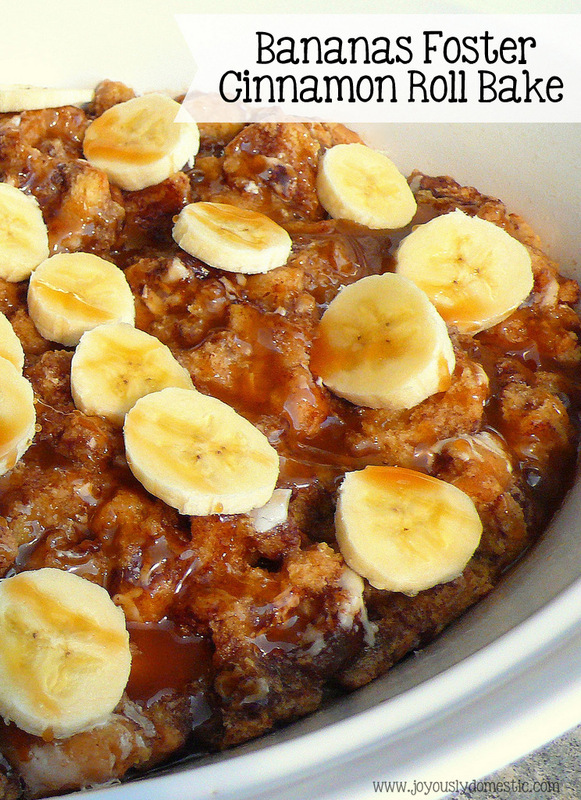 Top with sliced bananas at time of service and drizzle on the remaining 1/4 cup of caramel sauce.